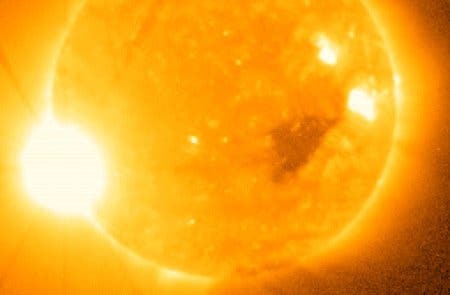 The next peak cycle of sunspot activity is predicted for 2012–2014, bringing with it a greater risk of large geomagnetic storms that can generate powerful rogue currents in transmission lines, potentially damaging or destroying the large transformers that manage power flow over high-voltage networks. In the worst-case scenario, the stockpile of spare transformers would fall far short of replacement needs. Urban centers across the continent would be without power for many months or even years, until new transformers could be manufactured and delivered from Asia. No comprehensive plan exists to retrofit the transmission grid with protective devices. In a decade, we will have our genome on our smart phones and be able to routinely gain access to those of prospective boyfriends or girlfriends, says Nobel laureate Barry Marshall. People would get used to the ins and outs of knowing their genetic makeup as the benefits to their health became clear and treatment got better targeted, he says. Marshall plans to become the first Australian to post his own full genome on the Internet, even though it reveals unsettling insights: three times higher lifetime risk of macular degeneration and double for testicular cancer and for Alzheimer’s disease. Researchers at The University of Manchester (UK) have been able to watch, for the first time, what happens to the brain as it loses consciousness. Using sophisticated imaging equipment, they constructed a 3-D movie of the brain as it changes while an anesthetic drug takes effect. The researchers said the real-time 3-D images seemed to show that losing consciousness involves a change in electrical activity deep within the brain, changing the activity of certain groups of neurons and hindering communication between different parts of the brain. By that time, nearly 3 billion people will be using the Internet — more than 40% of the world’s projected population. On average, there will be more than two Internet connections for each person on Earth, driven by the proliferation of web-enabled mobile devices. Internet traffic is projected to approach 1 zettabyte per year in 2015 — that’s equivalent of all the digital data in existence in 2010. Regionally speaking, traffic is expected to more than double in the Middle East and Africa, where there will be an average of 0.9 devices per person for a projected population of 1.39 billion. Latin America is close behind, with a 48% increase in traffic and an estimated 2.1 devices per person among a population of 620 million. A robot built at Leeds University in the UK, called Djedi, explored a mysterious tunnel thought to lead to a secret chamber in the pyramid – providing stunning pictures of so-far-undeciphered hieroglyphs written in red paint, alongside lines cut into the tunnel walls by stone masons. All are currently being analysed by egyptologists – and many more revelations are expected as Djedi's video streams are interpreted over time. Dassault Systèmes, a technology partner of the Leeds roboticists, has produced a compelling video fly-through to help people understand precisely where the tunnel was in the pyramid and where the hieroglyphics had been found.